Bookshelves, light fixtures, tables, chairs, desks…the list could go on. 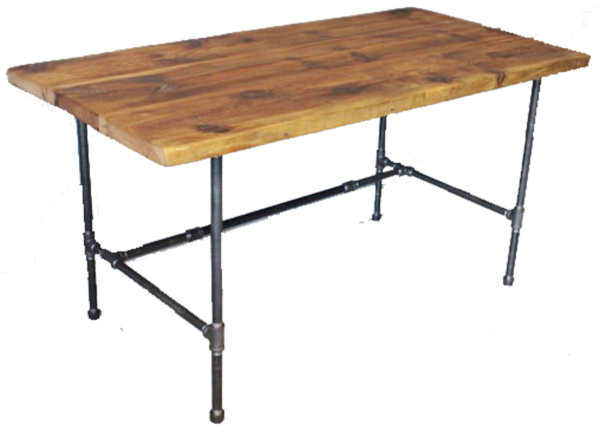 Pretty much every piece of furniture in your home has an industrial-style twin out there. 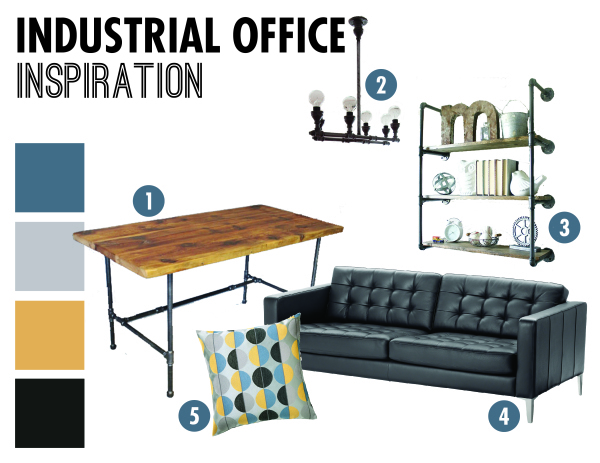 And since I’m making over Justin’s office and that’s the style he likes, I’ve been spending many an hour looking through lots of industrial office inspiration. 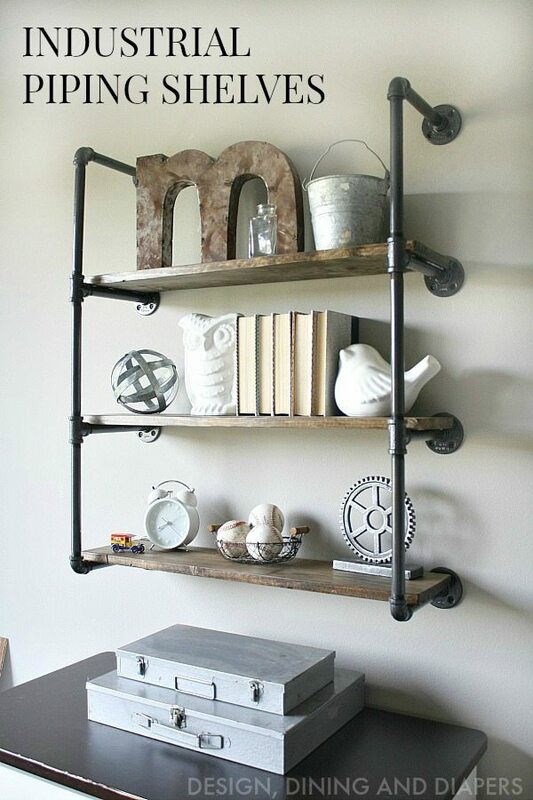 I must say, in another life, or at least another home, you might see some industrial-style decor. I’m kinda digging it. However, you won’t see it mixed through my comfy, cozy home at least any time soon. It just wouldn’t quite fit. Except in my man’s domain. Since he works from home and we have a five bedroom home, he gets a dedicated office. Seeing as we’ve lived here for a year and a half now, I figure it’s about time we make it over for him. I always start my room makeovers with a little mood board so here’s what we’ve come up with for his office. The one in Justin’s office was handcrafted by our friends at Three Arrow Design & Build. They are awesome and great to work with! It looks just like the one you can find here by DendroCo. There are so many gorgeous types of diy industrial light fixtures. However, I am seriously loving this DIY Steel Pipe Light Fixture from Something is Done. Something similar to this is going to look great in the office. Above the couch is a big open wall that is screaming for some gorgeous industrial pipe shelves to be built. Design, Dining, and Diapers built these gorgeous pipe shelves that are going to be perfect to fill this empty wall. 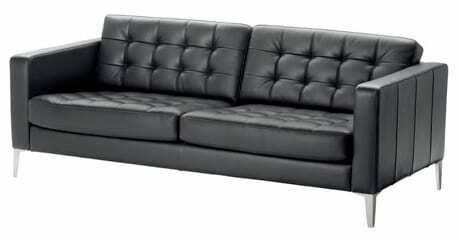 Black leather couches. Clean, sleek, and modern. Enough said. IKEA has this gorgeous KARLSTAD Sofa that is similar to the one we purchased. I love these OTTIL cushion covers from IKEA to help pull in some color. We found these cushions on sale and decided to design his office based off them and I love seeing them add some color in the office. So long story short, I am loving the industrial style right now and can’t wait to finish the office. What do you think? So far we have the handmade desk, beautiful couch we found on clearance, pillows, a curtain rod we made out of pipe, and a curtain sewn out of clearance tablecloths. I can’t wait to see it all complete and share with you all the details. What style are you digging right now?